Time and time again security cameras are catching porch pirates red-handed. 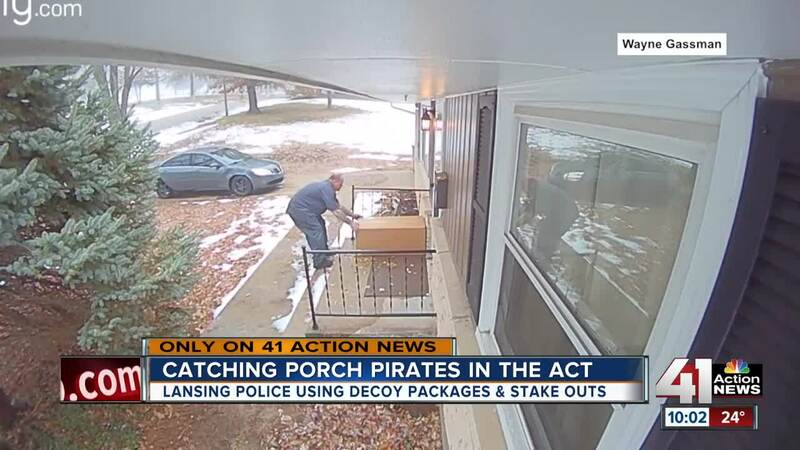 LANSING, Kan. — Time and time again security cameras are catching porch pirates red-handed. "People are seizing the opportunity that when people aren't home and they're not being delivered to their hands, they think that it's evidently ok to take it and it's not," Chief Steve Wayman of the Lansing Police Department told 41 Action News. Which is why Lansing police are once again conducting "Operation Krampus". The publicity surrounding last year's operation contributed to this year's success. As 2018 is wrapping up, they've only had a handful of reported package thefts. On Friday, 41 Action News rode along with Lt. Michael Dickason for a deeper look into the operation. "Because we have a city that's relatively low on crime it allows us to give extra attention to situations like this," Lt. Dickason said. "Throughout the Christmas season we'll have packages and officers in random locations throughout the city," Lt. Dickason said. They'll drop off the decoy package. "As soon as we see somebody going toward the house we'll wait until they grab the package before we head down there. Hopefully, we can intercept them before they get to their vehicle," Lt. Dickason said. During an hour-and-a-half stakeout, other packages were delivered, no one took the decoy this time. Last year, a mom and daughter were arrested. "I don't think thieves are thinking what it is in the long run at what happens if they get caught," Wayman said. Police say for porch pirates, it's only a matter of time. Be home when your package is expected to be delivered. Ask a neighbor to keep a look out for your packages. Have packages delivered to your place of work. Place a hold on your mail or requesting package pickup. Note: Do you have video of porch pirates stealing from your home? Send it to us and we'll post it to social media until the thief is caught. More info at this link.